What Is the Least Fattening Alcoholic Beverage? All alcoholic beverages contain calories, and if you eat and drink more calories than your body uses, you will gain weight. To limit this effect, choose the least fattening alcoholic beverages and try to compensate for them by eating healthier foods or fewer snacks. Remember to drink in moderation; even if you choose the least fattening alcoholic beverage, each additional drink adds more calories, slows your metabolism and stresses your liver. All wines have relatively few calories – about 80 to 110 per serving, depending on the type of wine. 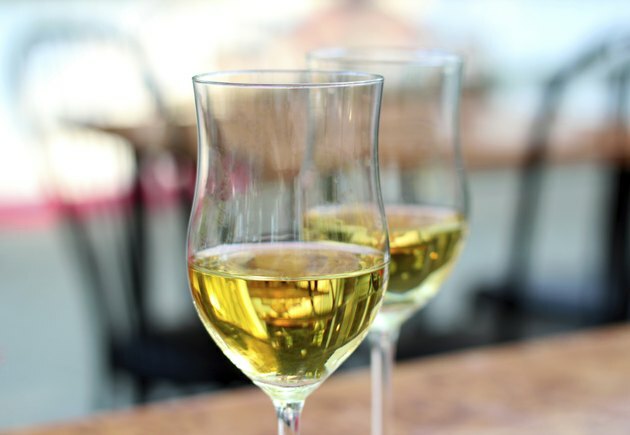 Dry white wine is the least fattening type of wine, followed by dry red wine and then sweet wines of either color. For the lowest calories, about 75 to 90 per serving, choose a dry chardonnay, sauvignon blanc or dry champagne. If you prefer red, choose burgundy, merlot or sauvignon cabernet. To drink one serving of wine, pour only 4 oz. – less than half of a standard wine goblet. A bottle of light beer, typically containing 12 oz. of fluid, usually has 100 to 110 calories, although it varies by brand. Hence, a light beer contains about the same number of calories as a glass of wine but it has three times as much volume. Among all alcoholic beverages, beer has one of the lowest calories-per-ounce counts. If you guzzle the beer, this doesn't matter much, but if you drink it at a moderate pace, this option can help you enjoy your beverage for a longer time without consuming more calories. One shot of straight liquor – containing 1.5 oz. of liquid – holds about 100 calories. This applies to any standard 80-proof liquor, including gin, tequila, rum, vodka and whiskey. Flavored liquors, such as Kahlua, schnapps, Malibu rum or Baileys, contain significantly more calories. Mixing the alcohol with juice or regular soda adds a lot of calories. Try a small martini, whiskey on the rocks or chilled tequila in a snifter. Because these drinks are full-strength, sip slowly. To stretch out the calories in a shot of liquor and to enjoy a more easily drinkable beverage, try combining liquor with a non-caloric mixer. Use diet soda instead of regular soda to make a whiskey and cola, a vodka in ginger ale, or a rum and Coke. Use diet tonic water to make a low-calorie vodka tonic or gin and tonic. Soda water or even plain water mixes well with whiskey or tequila, opening up their complex flavors so you can savor them more carefully. Always drink in moderation – no more than four or five drinks in a day. The "American Journal of Epidemiology" reports that one drink per day, three or five times per week, correlates best with a healthy weight.